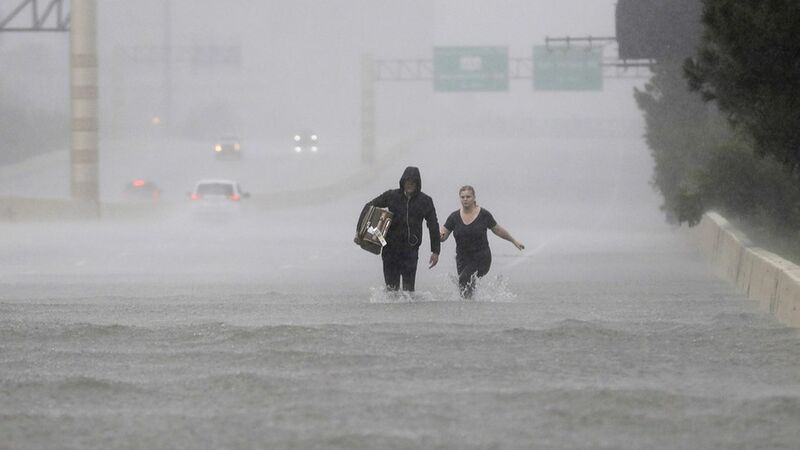 AP latest: "[O]fficials acknowledge the grim reality that fatalities linked to Harvey could soar once the devastating floodwaters recede from one of America's most sprawling metropolitan centers." The scale — N.Y. Times: "Local, state and federal officials conceded that the scale of the crisis was so vast that they were nowhere near being able to measure it, much less fully address it ... just the start of a disaster that would take years to overcome." The politics — AP's Julie Pace: "Trump ... has been particularly eager to seize the moment. He ... may return to the region again on Saturday. ... Trump sent about two dozen tweets about the storm since Friday, marveling at the size ... and cheering on ... responders: 'You are doing a great job — the world is watching!'" A Katrina comparison — N.Y. Times' Shaila Dewan and John Schwartz: "The Gulf region's capacity as an oil and gas hub ... does not appear to have been seriously compromised, and economists were predicting that the storm's cost would be less than half that of Katrina's." "Freight Firms Face Harvey Gridlock" — Wall Street Journal p. A1: "The gridlock will likely reverberate beyond Texas, threatening to snarl international trade routes. Houston is a key consolidation point for imports of vehicles and appliances made in Mexico ... The storm affected up to 10% of the U.S.'s trucking capacity." N.Y. Times Quotation of the Day — FEMA Administrator Brock Long, who expects 450,000+ people to apply for federal assistance: "The state of Texas is about to undergo one of the largest recovery housing missions the nation has ever seen." If you click only one thing: Where to donate.